There’s a car I often see in the parking garage with a sticker honoring a family member, a soldier killed in Afghanistan over a year ago. I don’t know the owner of the car. 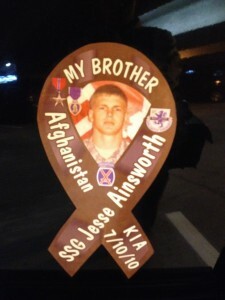 I certainly never met SSG Jesse Ainsworth, KIA on 10 July 2010. But every time I see that reminder of him and his death, I feel a wave of emotions. I deeply respect him. He volunteered to join the Army. He knew it would involve hard work and low pay. Though no soldier plans to give his life, he knew the risks of service, where each step could trip an IED or put him in the sights of an enemy’s rifle. He risked, and lost, his life for the sake of our country. No, that’s too abstract–he risked his life because he thought it was the best way for each and every American to enjoy life, liberty, and the pursuit of happiness. He risked his life so I can write science fiction stories and you can pursue the things you’re passionate about. He risked his life for a stranger. Not just one stranger–three hundred million strangers. I feel sympathy for his family. He left behind at least one sibling, and there’s a good chance he left behind one or both parents. I have a young son. If you don’t have a child, take my word for it: if my son died, I know a pit of grief and despair would open up and pull me in. I don’t know if I could ever get out. I can only imagine the suffering SSG Ainsworth’s family has gone through. And that imagination crashes on the knowledge that I don’t know what I could do if I ran into his sibling in the parking garage. “I’m sad for your loss”? Could a few words convey what I would need to say? Finally, I feel anxious sadness. He was only in the danger zone because the people we let lead our society–no, that’s letting us off easy. Because our society, not least you and me, are casting pearls before swine, sacrificing trillions of dollars and thousands of young men’s live in a vain effort to turn Central Asian tribesmen into middle-class Americans. It doesn’t matter what your politics are. Maybe you’re a liberal who thinks of Afghans as noble savages who should be free of American cultural imperialism. Maybe you’re a conservative who thinks of Afghans as barbarians who can do all the goat rustling they want, so long as they do it in Afghanistan. But the idea that we can turn Afghans into people like us, when they’ve been building their culture their way for thousands of years, is the height of hubris. Only some Washington insider, with an Ivy League degree in international relations and a giddy drunkeness at wielding the levers of power, could believe it. That belief would be ridiculous, except that its believers play on the higher instincts of men like SSG Ainsworth to get them to do the dirty work required. That makes that belief evil. RIP, Sergeant. A man becomes a hero when he returns from his adventures with a boon for his community. May a reminder to our society not to risk young men’s lives on fool’s errands be the boon you brought back with your remains. Posted on January 20, 2012, in Blog. Bookmark the permalink. Comments Off on A Citizen’s Thoughts on a Fallen Soldier.